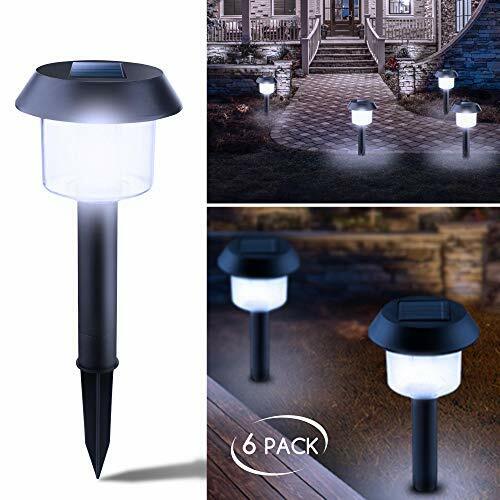 Maggift solar ground lights bright the darkness, adds a beautiful accent to the night landscape! 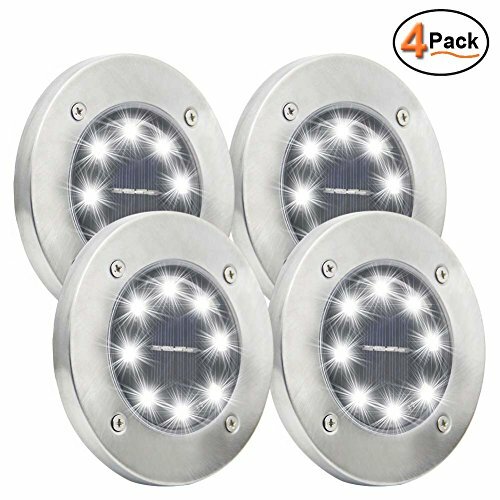 Specifications: LED: 8pcs LEDs Light color: white Charging Time: 6-8 hours Lighting Time: 8-10 hours Solar Panel Power: 2V 120mA Material: Stainless steel & ABS Product Size: Dia 4.72 inches for each Package Includes: 4 * Lawn lights 8 * Bracket 1 * User manual (English) Tips: Turn ON the switches before you install solar ground lights outside. For best results, install the solar light in a location with full, direct sunlight. Keep debris and snow off the solar panel to allow batteries to recharge. The more sunlight the solar light gets during the daytime, the longer and brighter it shines at night. 100% SATISFACTION GUARANTEED! Email us if you ever have issues with your solar lights, we try to offer a better shopping experience. 1. Turn the light on at the base of the unit by pressing the 'On/Off' button. 2. 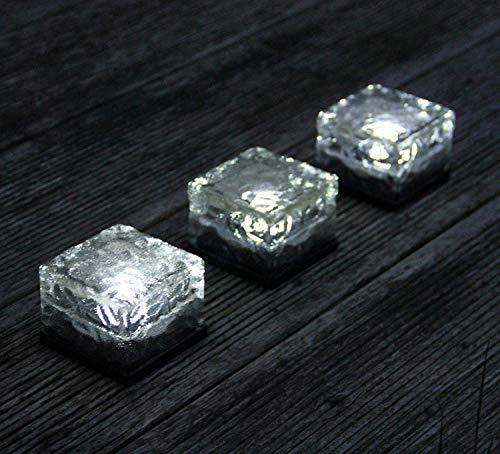 Place the lights in direct south facing sunlight. Allow a full day of sunlight to charge the lights fully. 3. The lights will turn on automatically once darkness is detected.1. Turn the light on at the base of the unit by pressing the 'On/Off' button. 2. Place the lights in direct south facing sunlight. Allow a full day of sunlight to charge the lights fully. 3. The lights will turn on automatically once darkness is detected. 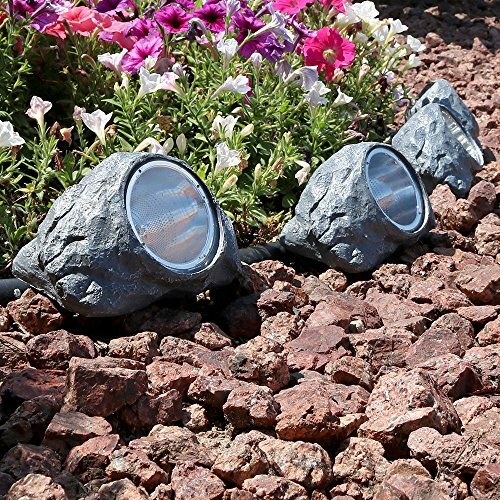 This Solar-Powered Outdoor Rock Garden 1 Light Flood/Spot Light is sure to blend in with nature's landscape during the day and shine brilliantly at night.This pack of 4 solar lights with warm white LEDs is designed to resemble real rock and stone. They charge during the day via sunlight, so be sure to place the lights in a location with direct sunlight to charge the AA Ni-MH battery. When they are fully charged, the battery can run for 6-8 hours, so they can illuminate your deck, yard, or any outdoor space all night long. No electricity or wiring is required! 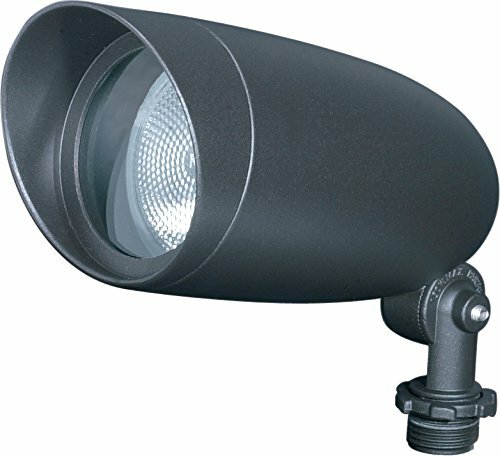 Features:*Built-in 300mAh NIMH rechargeable battery, crystal Glass LED Light*Solar powered - recharges during day, automatically comes alive at night*Strong sunlight Lasts over 8 hours on a full charge - use it all night long*Perfect for entryways, carports, driveways, garages,garden*Designed with heavy glass, sturdy enough for you walk on it.Specification:Solar panel: 0.1wLED:1PCSWorking Mode: Steady onLight Color: Cool white. 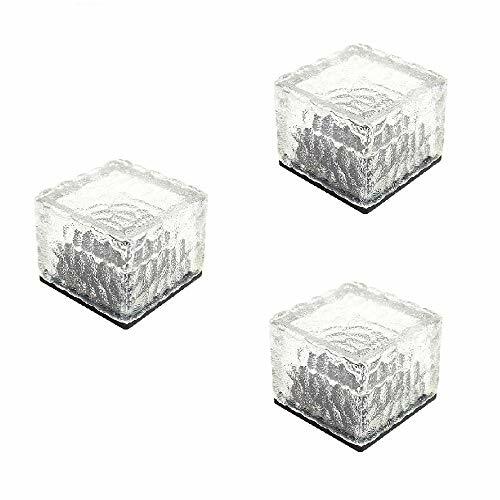 Material:Toughened/Tempered glass (not plastic)Battery:300mah Ni-MH rechargeable batteryWaterproof level:IP68 (can resist heavy rains).Lamp size: 7cm x 7cm x 5.5cm/2.8x2.8x2.2inch.Package Included:3 x Solar brick light(Battery included) Note:1.Please make sure the light is fully charged when you use it in the first time.2.For better waterproof properties the light without on/off switch and it will light up only in dark so when you test it you can put it in the dark environment after full charging. 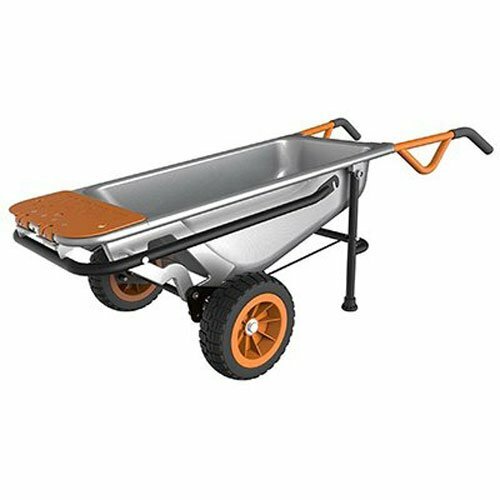 The WORX Aerocart is a multipurpose wheelbarrow and yard cart with the adaptability to convert into a dolly and perform several other uses. The Aerocart has features such as oversized, flat-free tires, fold-out extension arms and durable all-steel construction. The extension arms are used with various innovative accessories to carry flower pots, mulch bags, straw bales and other large, awkward items. In fact, the various accessories and attachments allow the Aerocart to perform the tasks of 8 unique carts: wheelbarrow, hand truck, cylinder holder, potted plant mover, rock lifter, bag holder, trailer mover and extended dolly. The Aerocart has a 300-lb weight capacity and a tub capacity of approximately 3 cubic feet, ideal for moving loads of wood, rocks, bricks, dirt or anything else you may need to haul. The Aerocart weighs around 48 lbs and it’s sturdy enough to tackle most yard jobs you can throw at it. The extension arms can handle loads up to 80 lbs., ideal for moving plants, rocks and other landscaping items. The patented two-wheel design easily adjust its center of gravity making heavy loads more manageable – the Aerocart makes a 200-lb load feel like 17 lbs, so it’s easy on your back and other joints. You’ll get more done in less time. 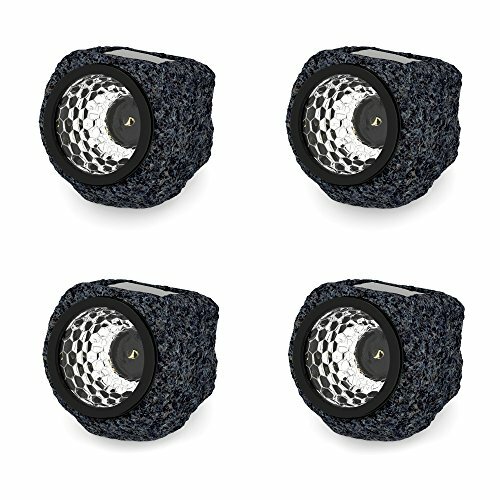 Want more Garden Rock One Light similar ideas? Try to explore these searches: Spring Blooms Border, Gff Metal, and Jeweled Internally Threaded Labret.